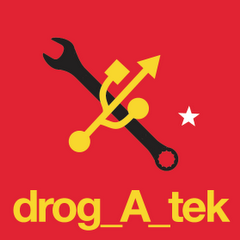 drog_A_tek is a flexible musical band re-inventing itself at each meeting. A mixed and eclectic set of improvisation disorder, formed in 2001 in Athens, they record moments in real-time and produce temporary audiovisual environments. They use objects, analogue and digital musical instruments, typewriters, frequencies, images, recording archives/waste and technology landscapes to which they manufacture small public fragmented narratives. drog_A_tek develop their shows beyond any normal use of their materials. Emitting, and receiving known/unknown stories and ephemeral desires. They print music, posters, stickers, write on walls and on the internet. They have played at the Athens Festival, in various clubs in Athens and Thessaloniki and many other festivals. Their soundtrack for Syllas Tzoumerkas’ Homeland won the Hellenic Film Academy Award for Best Music.